The Sweethearts Of The Rodeo!~Biography. Sweetheart Of The Rodeo" by the Byrds? What does this have to do with the story of "The Sweetheart's Of The Rodeo"? Well, it is the story! without the release of this album in "1968" Janis and Kristine would have called their duo another name. In "68" The Byrd's recorded "sweetheart of the rodeo" as their final album. The record had a real country sound to it, quite different from the kind of "Folk /Rock" music the Byrd's were creating in the mid "60's". Janis and Kristine Oliver grew up in Southern California. Music came one day when Janis started teaching herself how to play guitar, while learning to play Janis found out that her sister Kristine wanted in on the music too. Janis commented "I said 'OK, You sing the melody, and I'll see if I can figure out the harmony. And it's been that way ever since!" Janis and Kristine by the 80's had both re-located to Nashville. Deciding that that was the place they would land a record deal. And, that's just what happened, after winning a country music contest, they landed their first Record Deal with a major label. They then released their first self titled album, and soon had seven top ten hits, including their biggest hit "Midnight Girl (in a sunset town)" (Oddly the only song that most station's will play today of the sweethearts.) Their second album produced four top ten hits. The sweethearts at last had made a name in music for themselves. The sister's however wanted to try different thing's with music, styles, sounds, but were caught up into the country rock sound by radio and their label.. Kristine commented "We wanted to branch out creatively," Kristine says, "but every time we tried something outside the sound we'd been known for, radio wanted nothing to do with it." Though they tried different kinds of musical sounds, their label decided to not let the music be released, they wanted them to keep their old sound. They both commented "They just kept wanting us to do the same thing," Kristine recalls. "But they wouldn't let us out of our contract, either," Janis says. "It was a real depressing time." Endless touring and wanting to broaden out in the music business would keep the Sweethearts busy during the 80's. However, a change was coming with the 90's..at last they would be able to to create the music they wanted to record.. The 90's would now bring a change in music for the "Sweethearts". Starting out in the early "90's" they recorded two last albums for their label "Buffalo Zone" and "Sisters" an autobiography song about Janis and Kristine's special bond and friendship. After, recording the last two albums they decided to sign to a smaller label, where they would have more freedom over the kind of music they wanted to make. In 1993 "Rodeo Waltz" was released, a masterpiece of music and a journey into what should be called the Sweetheart's Grand Sound. On, "Rodeo Waltz" Janis would take lead Vocals on "Broken Arrow". Highlight's of the album would be the song's that Janis wrote, proving that she's a great writer. Of course Kristine's voice sounded better then ever, and the harmony's were truly something special. 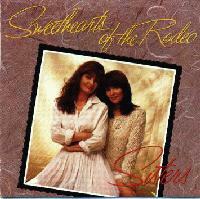 After "Rodeo Waltz" was released the sweethearts took some time away from the music. Until, 1996, when they released "Beautiful Lies", another journey into very creative music. The album offered more song's written by Janis, from "When the Morning Comes" to "I Know Who You Are". Recording also took place of song's written by some famous writer/singers "Catch the wind" (Donavan) and "One more night" (Bob Dylan). The sweethearts also ventured into something completely different from music. The opening of their own clothing store "Gill & Arnold" (The store has since closed). Janis became more involved into Horses, and even owns her own farm. The Sweethearts have not recorded since "Beautiful Lies" in 1996. In 2000, the Sweethearts closed their clothing store in Franklin, TN. Janis has since created an official website "Janis Online", and plans are underway for her to release a solo album.